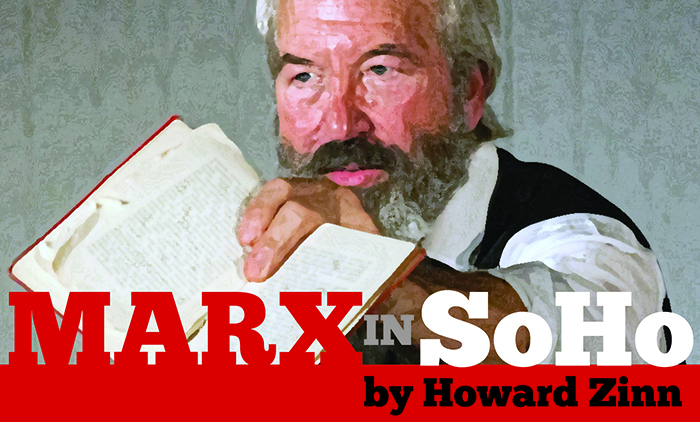 Nationally celebrated touring actor Bob Weick returns to Dickinson College for his fourth appearance as Karl Marx in a performance of Marx in Soho by Howard Zinn on Tuesday, Oct. 9, at 7 p.m. in the Anita Tuvin Schlechter (ATS) Auditorium.. A book sale and signing will follow the lecture. In Zinn’s one-person play, the revolutionary socialist, philosopher and political theorist Karl Marx comes back to life in the 20th century to defend the ideals of communism, rectify its past relegation and clear his name. The play is set in the Lower Manhattan neighborhood of Soho in recognition of the identically named London neighborhood in which Marx spent a large portion of his life. Zinn, a playwright, historian and social activist, depicts Marx with full complexity of humanness and its intersecting struggles by focusing on Marx’s role as a family man, husband and father. Weick is a veteran stage actor in Philadelphia. He is a two-time Barrymore nominee with Theatre Horizon and Iron Age Theatre, of which he is a company member. Weick’s relationship with the late Zinn was sparked in 2004 with the sold-out premiere of Marx in Soho in Philadelphia. Weick has since then performed the one-person play more than 300 times nationally. The performance is sponsored by the Clarke Forum for Contemporary Issues and co-sponsored by the departments of history, sociology, economics, American studies and the First Year Seminar program.